Verdict: Learning from the mistakes of its first Chromebook, Toshiba’s second attempt is a much better experience and it shows in a number of ways. 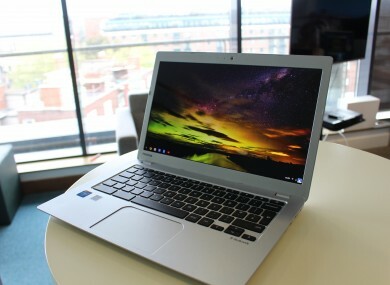 DESPITE NOT HAVING the same capabilities as a laptop or ultrabook, there’s a growing market for the Chromebook market, which offers cheap and lightweight computers. One company that got in on the action was Toshiba, yet its first Chromebook suffered from a number of problems. Trying to keep costs low meant it made one compromise too many when it came to quality and hardware, undermining what could have been a decent first effort. Now it’s taken a second crack at developing a Chromebook, but while it’s taken to heart criticisms from the last version, and some retailers dropping the price, is it worth purchasing? For one, Toshiba’s second edition is definitely one of the lighter entries out there and isn’t as bulky as the original. Weighing at 1.35kg, it’s noticeable but easy to carry in one hand. It’s ultimately the original design honed down into a lighter and sleeker version while maintaining a 13.3-inch HD screen. From a distance, you could mistake it for a metal laptop but it’s actually a plastic casing. While that keeps costs down, it doesn’t feel cheap as there’s no creaky sounds or soft parts that reminds you of this. Add to that a good range of ports available to you like HDMI, USB charger and SD port and it’s got all the basic requirements for any laptop device. The keyboard has a few nice features designed for online use. Where you would find the F1 to F12 buttons originally, you now have back and forward buttons, refresh, full-screen mode, window switching and the traditional brightness and volume buttons. It just makes things a little more convenient when you’re jumping in-between pages and allows for better flow between tasks. On the other hand, the touchpad is somewhat fickle for our tastes and has the same kind of friction the rest of the Chromebook has. You can adjust the sensitivity, but it never feels like you can get the precision you would like. One of the main criticisms from Toshiba’s original Chromebook was the screen which was washed out and made bright colours difficult to make out. This is a much better attempt. On any brightness level, you can make everything out from different angles and while it’s not going to compare favourably to more powerful devices, it’s a solid attempt. On a related note, the resolution is automatically set to 1920 x 1080, which it marks as best, but in all honesty, the screen quality isn’t quite good enough to justify it. Dropping it to 1536 x 864 does help improve the experience, but on the higher settings, you’ll find yourself squinting at times as you try to make out specific details. Where it matters is what’s powering it and to its credit, it does a great job in handling Chrome and its assorted plugins. With a 2.16GHz Intel Celeron processor and 4GB of RAM, it’s both an improvement on the original and it shows. Bootup speeds are quick – you don’t have to press the power button to turn it on making things faster – and it allows you to jump straight into the action. Even with the heavy duty apps like Tweetdeck and YouTube open, it’s still able to keep going without slowdown. Once you have more than ten tabs open (the two previous sites mentioned were also open), things start to lag, but it’s just a matter of keeping your tabs habit in check. Another thing worth mentioning is the sound. For a Chromebook, it’s surprisingly good thanks to its partnership with Skullcandy. The overall range is great and it’s hard to find any real complaints with it unless you nitpick. The webcam is low quality, it has a bit of difficulty adjusting to lighting, but it’s enough for the person talking to you to tell who you are. Also, battery life is average, usually clocking in at around 7/8 hours of jumping between normal and heavy use. It’s enough to get you through the day and is not too bad a price to pay for better specs. Storage space is also kept to a minimum at 16GB, but it’s encourages you to save online where it offers 100GB of storage on Google Drive free for two years. Since this is Chrome OS you’re working with, you have a a lightweight desktop OS which is fine for web browsing and working online, but excludes programmes like Steam or Photoshop. That limitation does keep things simple and to the point. Practically everything can be found within one or two clicks and you’re not going to be wasting time searching options to find a random feature to change. That’s both a good and bad thing for Chrome OS and if you’re looking for customisation (beyond minor settings), then your options are going to be limited. It also means that if you have no internet connection, its use will be further limited, but to be fair, there is a significant number of apps you can access offline which somewhat makes up for this. As far as Chromebooks go, Toshiba has certainly learnt from the original and has created one of the better Chromebooks out there. It’s true that some features are a little weaker than others, but you’re not going to find any dealbreakers in this case, something that’s more apparent with other Chromebooks out there. Overall, it’s a solid device that should be high up in your list should you be in the market for a cheap laptop, especially since the price has gone down in some places. It’s not perfect, but it at least shows that low-cost doesn’t meant low quality. - Great build despite using plastic. - Improved screen and hardware quality. - Chrome OS is still limited. - Fickle touchpad means sensitivity is never exactly right. - Screen quality means it can be difficult to make out specific details in high resolution. The Toshiba Chromebook 2 costs €259 – €320 and is available in a number of stores including Littlewoods Ireland, D.I.D Electrical, and Currys. Email “Toshiba's second Chromebook manages to right the wrongs of the original”. Feedback on “Toshiba's second Chromebook manages to right the wrongs of the original”.